So, inspired by Wendy's Lookbook, I went on the hunt for a black blazer today. Not a tough find, or so I thought. I brought Nat with me who's got a great eye for the unusual and I tried on so many different blazers, it hurt. Well, it hurt having to peel off all the layers I wore today. Broke all my shopping rules by not wearing light, neutral clothing and paid the price by not finding what I wanted. 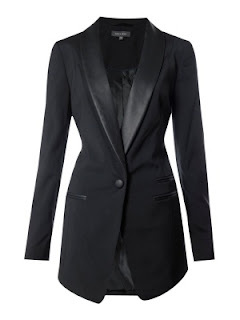 Closest I came was this gorgeous Pied a Terre tux jacket in House of Fraser. However, only in a size 8 and 14. Headed home despondent and ordered Wendy's jacket from ASOS. 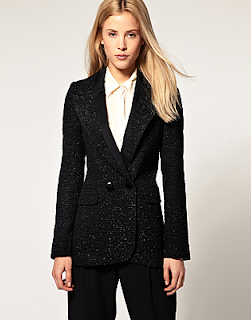 Also ordered a boucle blazer on a whim. Gave me free speedier delivery and I can send it back for free if it's a bit too sparkly in the flesh. Have you found the perfect black blazer and how do you wear it? I'll be on the lookout for great looking blazer wearers this week...watch this space!